It’s easy to think of hydroponics as a process that ignores the environment, removing plants from their native habitat, the soil. How could a soil-less growing medium be considered organic? Isn’t our precious soil the basis of ecological sustainability? The ‘Hydroponics vs. Soil’ debate has been going since hydroponics emerged, and, fuelled by years of research, shows no signs of stopping. There are pros and cons to any growing medium, and in terms of growth potential, hydroponics undoubtedly shows great results. A profitable growing system isn’t always sustainable though, so the question becomes – can hydroponic growth be environmentally friendly? The short answer is YES, ‘clean’ hydroponic growth does exist. However, staying clean and getting that “organic” stamp of approval may not yet be feasible. In this article, we will look into the history of hydroponics and why many growers choose to grow this way. We will look at different systems for hydroponic growth, and also show that some of the newer methods, in a similar way to soil, allow for organic biological interactions. Finally, we will discuss the current regulations surrounding organic growth in Canada, and ultimately determine if organic growth via hydroponics is possible. Many growers still believe that soil is the only “organic” way to grow, let’s dig into the why! Where Did Hydroponics Come From? Hydroponic systems easily evoke imagery of futuristic “sci-fi” scenes, but their roots (no pun intended!) go back surprisingly far in history. How far back you may ask? How about the beginning of life itself! Evolutionary science believes that the earliest plants evolved in the ocean, from bacteria into aquatic algae, then eventually adapting to become land plants. All things considered, it could be argued that hydroponic growth actually preceded soil growth! This, however, is a farther back than we need to go. The first suggested human use of hydroponics is found in a collection of writings on the Hanging Gardens of Babylon (around 600 B.C.). 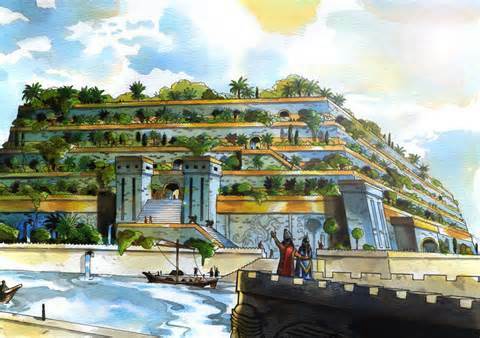 Here it is said, for the sake of a homesick wife, King Nebuchadnezzar II constructed a giant set of gardens using only water and rock. These gardens consisted of terraces reaching 75 feet above ground, and would have been an unbelievable sight in such an arid climate. This was the first time, of many, that hydroponic growing practices were described throughout our agricultural history. From ancient Egypt’s soil-less growth along the Nile river, to Central America’s Aztec floating gardens, hydroponic growth has been used frequently – almost always as a tool to battle infertile soil. In our series on the Significance of Soil, we learned that soil degradation is currently happening at an alarming rate. If this continues, then within our lifetime, all of the worlds’ topsoil could disappear. If ancient civilizations used hydroponics in areas where the ground was not fertile, could we not also do the same? Many growers in support of hydroponics believe that this method may be a solution to save our environment. Soil loss is largely a result of poor agricultural practices, such as deforestation and chemical soil processing, which are not typically used in hydroponic growth. Hydroponic growth is done in smaller artificial environments, and if unused urban areas can be utilized, this process could potentially protect natural environments. Another benefit of hydroponic growth is the conservation of water. By recirculating water, hydroponic systems only use about 10% of the water typically used in soil-based systems. 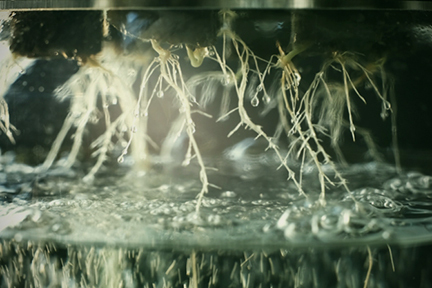 Hydroponics also allows for a greater control than soil does, with a process that is easier to automate. With hydroponics, the grower is in control of the exact nutrients that the plant receives, within the perfect light and humidity conditions – the ultimate growing trifecta! But what about the cannabis? With exact nutrient, light, and humidity control, it’s not hard to believe that hydroponics can result in high-quality, potent cannabis. The perception that hydroponics produces MORE potent cannabis than soil is quite common, but there is still little to no evidence to prove this. Of the limited research that has been done on THC content comparisons, the sample sizes are small and the variability is often too large to reach any solid conclusions. Though there has been an increase in cannabis potency over the past few decades, there are many factors at play. Many believe that this increase can be attributed to selective strain and breeding principles. One proven benefit of hydroponics is that it does allow, with its more precise control, for faster plant growth. Though this may seem ultimately more profitable, studies suggest that in terms of THC content, the outdoor varieties may still out-compete indoor production. This can be attributed to the amount of plant matter produced, as outdoor growth is usually not limited by space. Ultimately, the indoor vs. outdoor growth debate is not the same as the hydroponic vs. soil debate, and there is little evidence to conclusively support a winner in one or the other. With the recent legalization of cannabis in Canada and the increase in funding for cannabis research, we can only hope to have more answers soon! Is Hydroponic Growth Bad for the Environment? Currently, under the Canadian Organic Standards, no form of hydroponic system can be certifiably organic. This begs the question, is hydroponic growth bad for the environment? One common disadvantage of growing with hydroponics is the high energy input, as the plants require precise control of light and humidity. This process also requires a greater start-up cost, as the grower must invest in the equipment needed for the hydroponic setup. These, however, are not the sticking points with regards to organic certification. The biggest criticism that hydroponics faces in the organic community is the ‘sterility’ of the system, in short, the lack of microbial activity. Most growers don’t frown upon soil additives and inputs, but they do consider the microbial processing of these inputs to be essential. 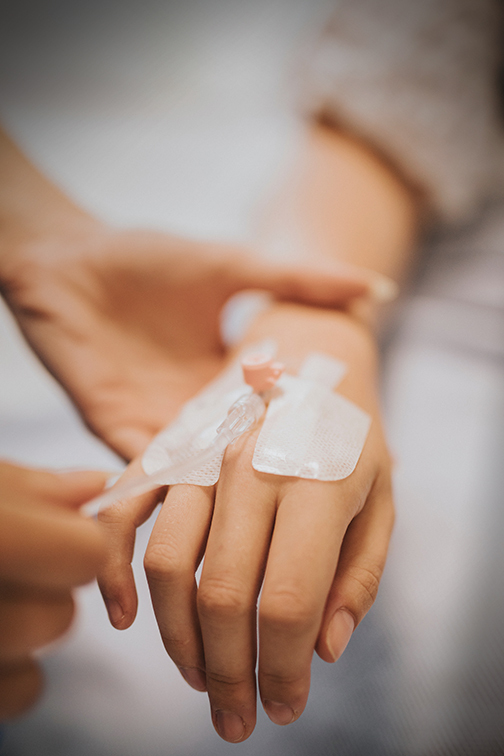 It is possible to determine the nutrients that plants need, but difficult to replicate the actions of microorganisms in processing these nutrients. Another criticism that hydroponics faces is, because of the lack of microbial activity, fertilizer solutions are required to be inorganic. 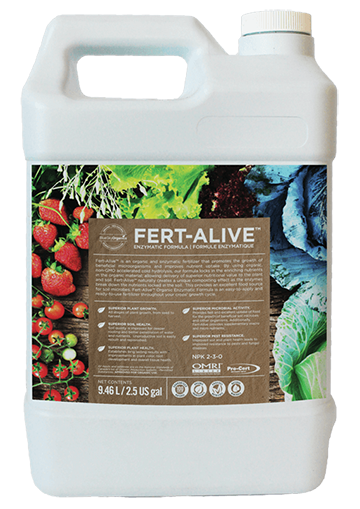 In a natural system, organic fertilizers are converted to inorganic nutrients, so that they are available for plant use. In a hydroponic system, without the natural breakdown of organic material, the remaining material can end up accumulating in the system. This build-up, unfortunately, can end up being toxic to the plants over time. There have been some proposed solutions that allow for the use of organic inputs in hydroponic systems. One possible solution is to first process the organic solution by adding compost tea, and then add the processed solution to the system after. Another related solution would be to have separate compartments within the same system designated for organic processing. Hydroponics is a broad category, and there are some promising growing systems gaining popularity in the organics sector. Aquaponics is a hydroponics system that uses fish as means of processing plant material for food, and as a result, provides microbially-processed fertilizer for the plants. In a sustainable aquaponics system, the end results are edible fish, edible plants, and clean water. When it comes to growing cannabis, an aquaponics system does still require a few nutrient inputs, making the system not completely closed. However, with the use of a double-root zone, it is possible to do so without contaminating the water. 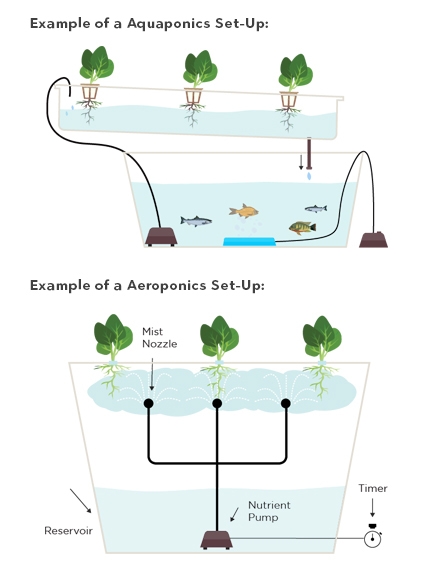 Aeroponics is another alternative to traditional hydroponic systems, in which a nutrient-rich water solution is sprayed on the roots and lower stems of the plants. The rest of the plant is separated by a barrier, creating a chamber for misting that allows for control of sterility. It is possible to use organic fertilizers in the misted solution, as the roots are not left in the solution. The oxygen-rich environment of aeroponics allows for microbes on the plant to process the nutrients. This means that constant supervision is required to make sure that the solution is being properly delivered. Organic fertilizers tend to have more particulate matter, so making sure that the holes on the nozzle don’t get clogged is important. Constant water supply is also vital, as roots without water can start to die within an hour of system failure. Both these alternate hydroponic systems have potential in the organics sector, but they can also be expensive, risky, and require a fair amount of knowledge to be successful. So, what’s a grower to do? We’ve already mentioned that under Canadian standards, hydroponic growing systems can’t be certified as approved for organic use. 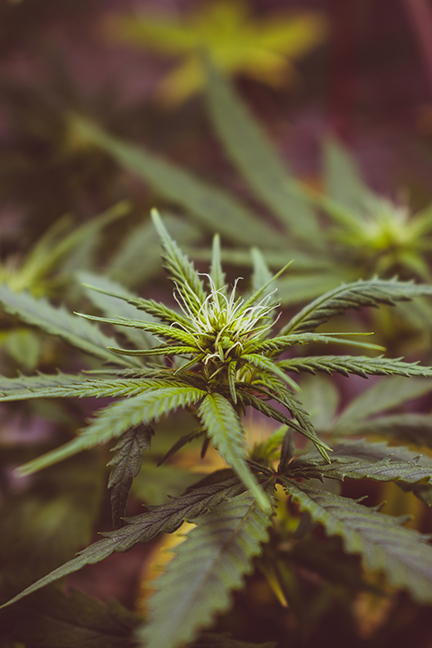 Registering any cannabis as organic in Canada requires a unique process, as cannabis is currently considered outside the scope of the Canada Organic Regime. Because cannabis falls outside of this scope, certain allowances have been made for organic registration, which is where the USDA National Organic Program comes in. In Canada, cannabis can be grown and sold as certifiably organic, if it is registered under the USDA. In the United States, organic hydroponic systems are legally recognized, making it possible for hydroponically-grown cannabis to be labeled as USDA organic. However, it still can’t be sold or marketed as organic in Canada. The Canada Organic Regime is currently overseen by the Canadian Food Inspection Agency (CFIA). This may mean that once cannabis edible products and concentrates become legal (which will require involvement from the CFIA), that a revision to the organic standards may also take place. This however is just speculation, and only time (and research) will tell if certifiably-organic cannabis, grown via hydroponics, will be granted a legal place in our country. At BlueSky Organics, we are dedicated to revolutionizing both indoor and outdoor growing. Our heart and soul goes into creating the industry’s best plant nutrients and amendments, using only the finest certifiably-organic inputs.At BlueSky Organics, all of our inputs and additives are OMRI approved, meaning that they have been approved for organic operations. In addition, our products are also Pro-Cert Approved, meaning that they have been accredited by the CFIA. Though these products can’t yet grant you certifiably-organic cannabis through hydroponics, they will be essential if regulations do change. It is the CFIA that oversees the Canada Organic Regime, so why not start by using products that they have already approved in their own accreditation process? Can I Use BlueSky Organics Products with a Hydroponics Set-Up? The short answer is YES! As we mentioned earlier, many organic products can be toxic to hydroponic systems. This is not the case for many BlueSky Organics products, including Fert-Alive, Flower Two, Myco-Grow, pH-Up & pH-Down, and Organic Booster. These products are all water-soluble, and are therefore safe for most hydroponic systems. In addition, our Organic Reactor and Vit-Alive compost tea are also safe for hydroponic use, as long as their granular contents are contained within a tea-bag or separated with a fine-mesh. At BlueSky Organics we are committed to our growers, to high-quality cannabis, and to keeping our process sustainable. With many years of experience in the industry, we are also able to offer organic production consulting and certification. Whether you choose to get your hands dirty in our Super Soil, or venture into soil-less alternatives, we can work with you to ensure your vision is met and growing is green.